You are here >> Clothing >> Boots & Shoes >> NRS Boundary Shoe. 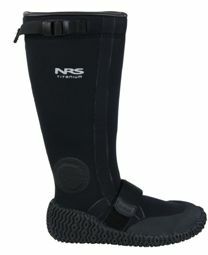 The NRS Boundary Shoe is knee high, waterproof and warm. Great for those wet, soggy put-ins and portages. Individually tested to ensure waterproof performance. The NRS Boundary Shoe is a knee high waterproof shoe which is warm in cold conditions. 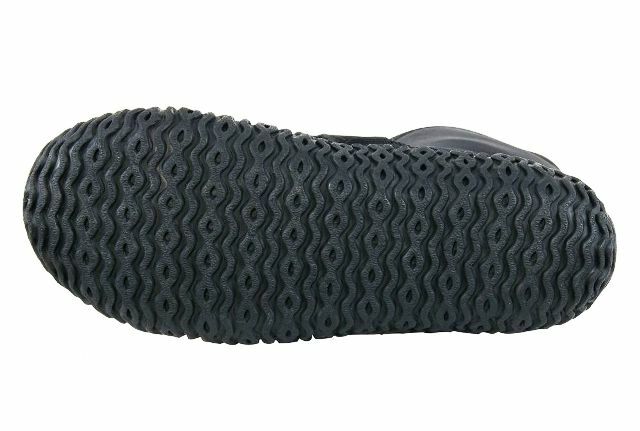 The Boundary Shoe offers great protection from rocks and sharp objects with it’s 2mm plastic sole and comfy 7mm neoprene insole atop a high traction wrap-up sole which provides protection and support. The upper part of the Boundary Shoe is a waterproof 5 m neoprene which is glued, blind-stitched and has double-taped seams to keep your feet warm and dry. The ladder buckle strap at the top and the sturdy instep strap ensure the shoe stays in place even in the muckiest conditions.NRS factory test each Boundary Shoe to ensure waterproof performance. The NRS Boundary Shoe is the ideal shoe to wear over your Drysuit whilst sea kayaking or sit on top fishing out at sea or even on the bank or beech. Waterproof 5-mm neoprene upper has glued, blind-stitched and double-taped seams to keep your feet warm and dry. Comfy 7-mm neoprene insole atop a high-traction wrap-up sole provides the protection and support. Size: 9, 10, 11, 12 & 13. Availabe in UK Size 9, 10, 11, 12 & 13.